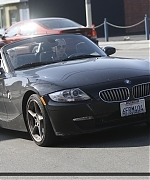 Amber appeared recently in West Hollywood, in her car with girl friend Tasya Van Ree. I have uploaded 5 new HQ pictures of this candid. I love Amber on this candids. I also changed the theme of the pictures gallery!! I hope you like it.